Empty your mind, be formless, shapeless; like water. Once the sequence bursts into effulgent, fuzzy light showers to Todd Michaelsen’s sitar-and-synth stabbing beat, we are introduced to characters of the Ramayana, each representing only one of the styles of animation found in the film. And at its center, the the human heart, beating fierce at Mother Earth. A discussion with Director and Animator NINA PALEY. How did you develop the various artistic styles for the film? The differences are striking. NP: I immersed myself in Ramayana art. There’s thousands of years of it from pretty much every country in South and Southeast Asia. I had no shortage of inspiration. 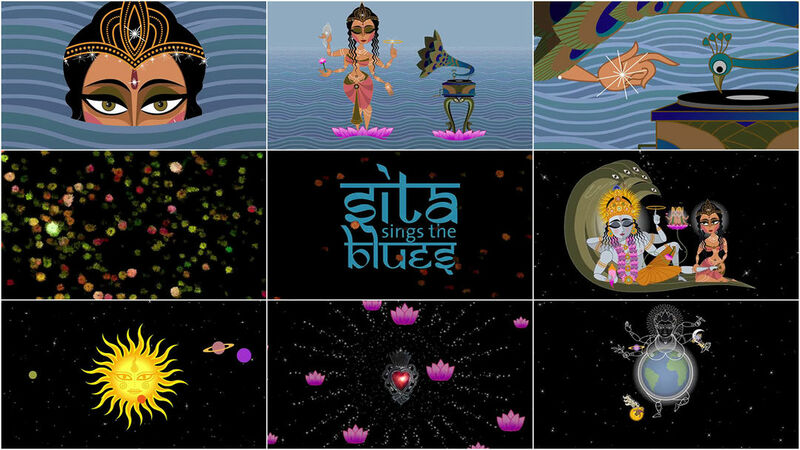 The visual styles in Sita are but a tiny sampling of what’s out there. As to how I chose… everything in the film felt like it chose itself. If anything seemed to work, I went with it, and if something didn’t work, I threw it back. I knew from the gut, or maybe the heart. I like to think all my organs were cooperating on this, even my brain. Why did you feel that this story needed to be a feature film? I wanted to work through the story for personal reasons. It’s a big story – it called for feature length. Initially it was just a short, Trial by Fire, which was three minutes. Most audiences liked it but didn’t get the Ramayana references. I realized I’d have to expand the story for audiences to receive my message. My art isn’t finished until an audience “gets” it. How did you discover Annette Hanshaw’s music? After my husband dumped me by e-mail, I was staying with various friends of friends. One place belonged to a record collector and some old Hanshaw recordings were on his shelf. My friends played Hanshaw’s “Mean to Me” and I was hooked. Later, one friend bought me an all-Hanshaw CD he found. I played that thing over and over during the months after my break-up. What about those recordings made you think it would work for this film? 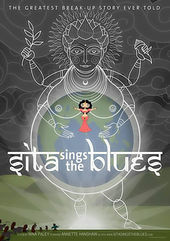 The synchronicity of the Hanshaw songs and Sita’s story is uncanny. This impresses audiences and allows the film’s point to be made: the story of the Ramayana transcends time, place, and culture. Because the songs feature an authentic voice from the 1920s, they demonstrate that this story emerged organically in history. New songs composed by the director, while they could be entertaining, could not make that point. They would be a mere contrivance, whereas the authentic, historical songs give weight to the film’s thesis. They are in fact the basis of it – irrefutable evidence that certain stories, like the story of Sita and Rama, are inherent to human experience. Is there some element of the film that you feel really close to? I think my favourite scene is “Agni Pariksha,” that rotoscoped bit that comes shortly after the intermission. It doesn’t feel anything like the rest of the film – it’s not funny at all. It was my attempt to convey what my heartbreak felt like, emotionally. Although I only got a tiny little fraction of the experience in there, I think it works. In some ways it’s the heart of the movie. How are you keeping the copyright issue from overshadowing the film itself? How will copyright inform your creativity on future projects? I am never again going to close-license or copyright my own art! Any publisher or distributor that wants to work with me is going to have to accept an open license. Open content has been generating lots of money in software for years and it’s time for popular culture to follow. And what’s next for your art? Freeing Sita! I’m currently a full-time free culture activist. And I plan to make some short cartoons on this current obsession.